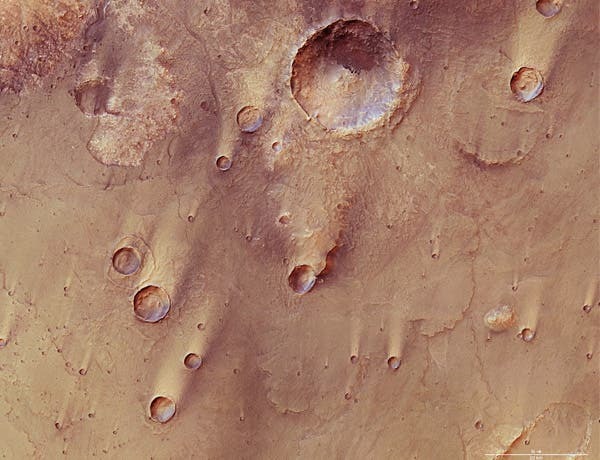 Mars' mysterious 3 billion years old Syrtis Major shown above in this Mars Express image was once thought to be a shallow sea. The region, first discovered in 1659 by physicist and astronomer Christaan Huygens, who used its appearance during the planet's rotation to help calculate the length of a day on Mars, has volcanic origins, with lava flows and partly-filled impact craters visible above. Features resembling ancient shorelines have previously been identified in images from several spacecraft and Mars Express has now used radar to detect sediments reminiscent of an ocean floor within the boundaries of these previously identified ancient shorelines. "It is a strong new indication that there was once an ocean here," says Jérémie Mouginot of the Grenoble Institute of Planetology and Astrophysics (IPAG) and the University of California, Irvine. Mouginot says an ocean first existed 4 billion years ago, when warmer conditions prevailed on Mars. A second ocean may have formed a billion years later when subsurface ice melted following a large impact, creating outflow channels that drained the water into areas of low elevation.